Welcome to Day 7 of the 7 Days of Halloween Inspiration Blog Event brought to you by "The Inspiration Crew". We’re a group of online crafty friends who love being creative. I can't believe today is the last day!! For my Day 7 Project I'm sharing a card I made using lots of fun supplies. The papers and corner chipboard stickers are from We-R-Memory Keepers. The graveyard and ghost dies are from Memory Box and the stitched letter template is from a We-R-Memory Keepers Holiday Sew Easy Template. I've really been wanting to use that stitching stencil and I finally got a chance. I used very think Friendship Bracelet Thread I bought at Wal-Mart. The ghosts were cut out of white glitter paper. I outlined the gravestones and edges of the paper with a Gray Faber Castell Stampers Big Brush Pen. Thanks for stopping by all week and be sure to check back November 15 for our Thanksgiving Inspiration Blog Hop and December 1 we'll kick off our 3rd Annual 12 Days of Holiday Inspiration Blog Event. Be sure to leave comments on all our blogs for chances to win some awesome crafty prizes!! Great card Donna! I really like those little ghosts and using glitter paper is a great idea. Thanks for a fun filled week. Wonderful card! The little ghosts are really too cute to spook! Wow, I love that stitched sentiment and the cute ghosts! Cute cute cute! Love your little ghosts out of glitter paper and the stitching! 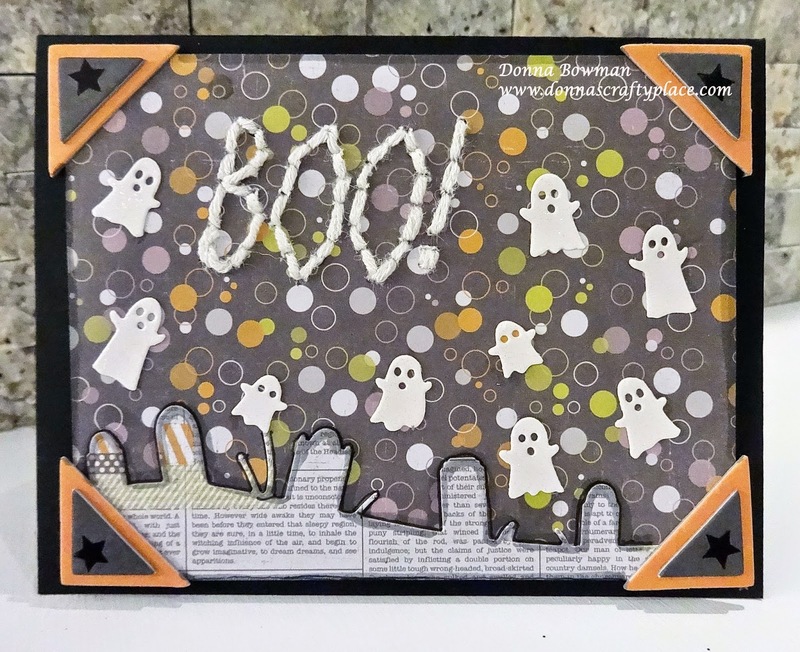 fun card... love all those little ghosts! So cute - love all the little ghosts. Oh sewing, now that sounds like extra hard work, your card is so much FUN!